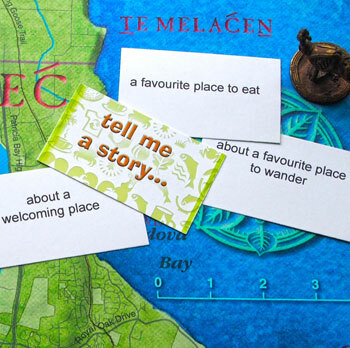 Based on a 'conversation game', created by Dan Dougherty from the Fernwood Community Green Map, we've piloted a community mapping game that consists of a set of conversation prompt cards and story capture sheets. This latest iteration of the game includes prompts suggested over the last few years by the UNI 102 students. A draft PDF of the cards can be downloaded here, as well as a story capture sheet and instructions here. A translatable, editable PDF can be downloaded here. There are no winners or losers to this game! It’s all about getting to know one another and discoverying our shared love for the places we call home. Delegate someone with a watch to be the time keeper. Use a map of your neighbourhood, area of interest or be creative and draw a map! The first person picks a conversation prompt card from the pile and has 1 minute to share a story inspired by the prompt without interruption. Put a numbered sticker on the map to identify the story’s location. Speak your truth! Listen with an open mind and open heart. When you respond or ask questions, add value and keep it constructive. The person to their left jots down the essence of the story.